A Russian roulette trick has been pulled from celebrations to mark 100 years of magic in Leeds following objections to the use of guns. 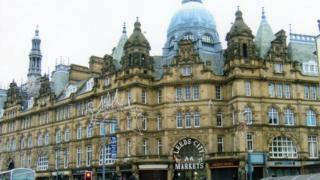 The routine had been due to be performed at Leeds Magic Circle's centenary event at Kirkgate Market. However, concerns from traders prompted Leeds City Council to ask for the performance to be changed. Magician Franklin Arbisman said it was the first time he had been asked to drop the act in almost 40 years. Mr Arbisman, the president of the Leeds Magic Circle, said he had been performing the routine, involving four starting pistols - three of which are loaded with blanks - since the late 1970s without objection. "I totally agree that in the wrong hands guns are lethal and they are not for playing with," he said. "But I would not put a gun to my head if I saw a magician do it, would you? "I understand the concerns that people have but there are re-enactments of World War Two and other things and this is just another re-enactment." He said he was told of the traders' concerns in an email from Leeds City Council on 29 March, after posters advertising the event, in support of the Royal National Institute for the Blind, had been printed. The email, seen by the BBC, said: "A large majority of the traders have a great concern over the Russian roulette trick that you wish to perform in regards to the use of guns. "As a market that is open to the general public, and people that may not want to see the use of guns we have to take these comments and concerns on board. "We would appreciate you looking at the performance and maybe changing it to one without the use of guns." Mr Arbisman said the council had also refused to allow an escapologist to attempt to replicate Harry Houdini's escape from a straight jacket while suspended from a crane. The council said the risk assessment supplied fell "someway short of what would be expected".